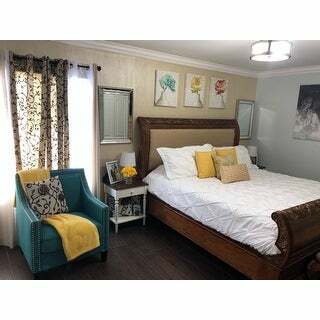 I liked it, it looked beautiful in my bed, I wish it were bigger in the sides because my bed is king size. Unfortunately I don’t find a duvet with over measure. Enhance the look of your bedroom with this oversized solid duvet cover set, made of soft and wrinkle-resistant 110-gsm microfiber featuring beautiful and sophisticated pintuck detailing. Available in an array of soft and bold hues, this machine washable duvet cover set includes internal corner ties on the duvet cover that can secure your comforter. It looks good and fits well even though my duvet is a couple inches different that it's deminsions. I love that it has ties for the inside corners so it doesn't bunch up. My only wish is that it was Cotten instead of polyester so it could breathe. The duvet cover is Beautiful! I was pleasantly surprised with this duvet set. I wasn't expecting much for the price and was a little worried. But after washing and putting them on my bed, I see that these are really nice. The pintuck gives it a nice overall look. It doesn't look or feel cheap. Most importantly, they are good quality and soft. I actually have a king duvet insert, and the queen fits mine just fine. I bought the taupe color, which is a soft/medium brown- a good neutral color. This duvet cover is ok. The fabric is a very soft microfiber that does not have a lot of body, I prefer more crisp fabrics, but the color works. 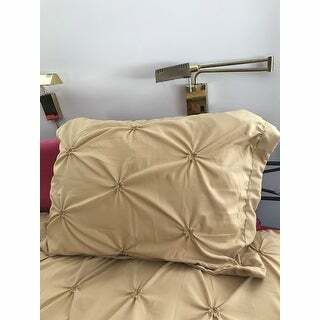 As a result of softness, the pillow shams just don’t work, looking floppy and messy, but this is true of nearly all shams. (See before and after photos) I ended up taking the shams apart (removing the stitching around the flange) and inserting a stiff ultra firm Pellon stabilizer to cover the whole front side and then re-stitching the flange for a more crisp look. I should mention that when removing the flange stitching, the front of the flange also separated from the sham requiring it to be re-stitched before adding the stabilizer. When first unfolded, the pieces were very wrinkly, but I sprayed a wrinkle released and over a couple of days it looked better. I hope it will wash well and not be too wrinkled looking. The pintucks are ok and add some texture to a plain color. Also the corner ties are a nice feature which led me to sew loops to my duvet rather than pin it as I have done for many years. Beautiful duvet cover. Love the purple color! 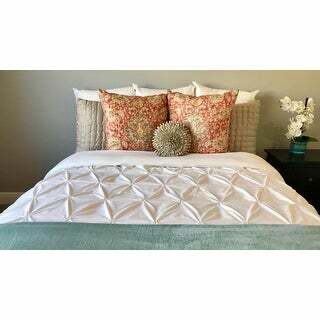 This duvet cover and pillow sham is quite stylish. It washes well with a minimum of wrinkling. I recommend. The duvet cover is very soft. I washed it a few times and it's still holding up. I like how it has ties on the inside corners to hold the duvet in place and that it comes with pillow shams instead of pillowcase. 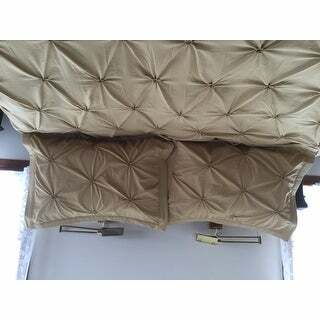 The shams prevent the pillow from coming out of the case. The duvet cover does have buttons at the opening which makes it less sleek but for the price it's a good purchase. I got the silver grey cover and wished it looked less dull. The Pintuck Duvet looks very nice and is good quality. It is just slightly larger than the comforter even though the sizes are technically the same (King). A snugger fit with the comforter extending right into the edges would have been a bit better but overall pleased with the product. It is only a couple inches on all sides. I got the teal color and it is as beautiful as it appeared on screen. The set is soft and the pintuck detail is nice. 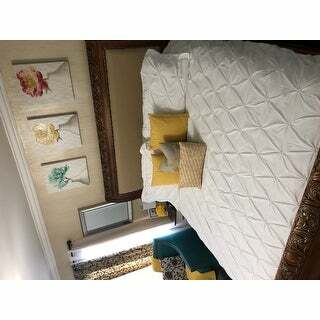 I loved this duvet cover - it covered my queen bed nicely and it was very soft - looked great on the bed. Did not care for the weight or quality of this duvet. Was not what I was hoping for and not what I would put on my king size bed in a master bedroom. Maybe for a kid's room, but not something you'd put in a master. I returned it. I am very pleased with the aesthetics and quality of the duvet. Washes well and wrinkle free. Perfect fit and very soft. The cover is very nice, but the silver gray color is really just kind of a dull gray. It's darker and doesn't have a sheen like in the photo. It's still nice, but different than I expected. I like that it has ties on the inside corners so that the comforter doesn't move around so much. Item looks really good but the Cashmere color was way darker than shown. Looked more like Taupe color. I expected this duvet cover to be a deep chocolate brown as shown in the photo. It is anything but! A faded dull brown like it had been exposed to the sun for years. I'm going to look for something different. 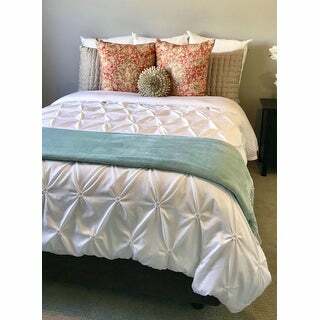 I so loved this duvet and it looks much better on your bed than in the picture. I never use the duvet pillow shams because I don’t want to lay my head on it. But you’ll love it. My dogs sleep on my bed. It is easy to shake their fur off of this duvet. This duvet washes easily, and looks incredibly good at all times. 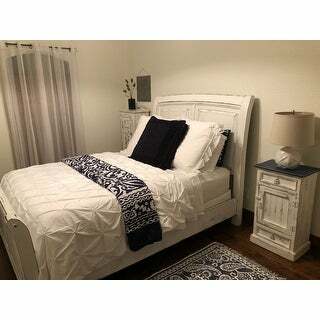 Beautiful duvet cover- fits perfectly! The item is described as a teal. It is not! It is more of an emerald green color. As far as the quality of the product I can not comment on that. I’m happy with this purchase. It brightens up my whole bedroom. The color is just the right shade of red. I would def recommend this product. 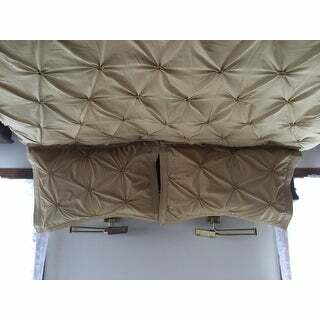 Very soft and excellent quality! We absolutely love this duvet. Looks expensive and we get compliments. It’s elegant and doesnt wrinkle easily in the dryer. it's very pretty. I love the look. 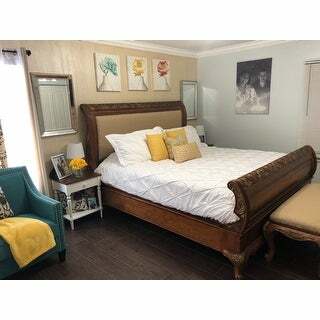 Exactly as described, it has held up really well in the wash. Great material, does not need to be ironed and looks great on the bed, especially if you are looking for a white duvet with some character. "Is the white duvet see through?" The white duvet is not see through. "Is this a satiny-shine finish or a flat-cottony look? " This has a flat-cottony look. It has a cottony look but the fabric is smooth and after a couple of days on my duvet, was completely wrinkle-free. Also, the overall quality and look is great! "do you have sheets to match the grey"
"Will you be getting Grey (king) back in stock? " Unfortunately we don't know when this will be back ins stock. We apologize for any inconvenience we might have caused. "How would you describe the cashmere color, is it a light taupe color?" I purchased the Taupe color, and it actually resembles the Cashmere color photographed. So I'm a bit confused on the difference between Cashmere and Taupe for the set. The "Taupe" is a nice neutral color though. "Do you sell a bed skirt to match this Purple Duvet?" It is for my daughter's college apartment.